We strive to be an integral part of the marine community by providing industry training, certification programs and extensive support for distributors and dealers. 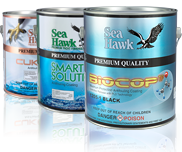 As a Sea Hawk dealer or distributor, you sell superior paint that offers consistent protection and longevity, increasing customer satisfaction and loyalty. Plus, service facilities that become Certified Sea Hawk Applicators have a competitive edge by offering the Sea Hawk Antifouling Written Guarantee.